The second major international airport of the German capital is located approximately 14 miles southeast of Berlin city centre, near the town of Schönefeld, Brandenburg. 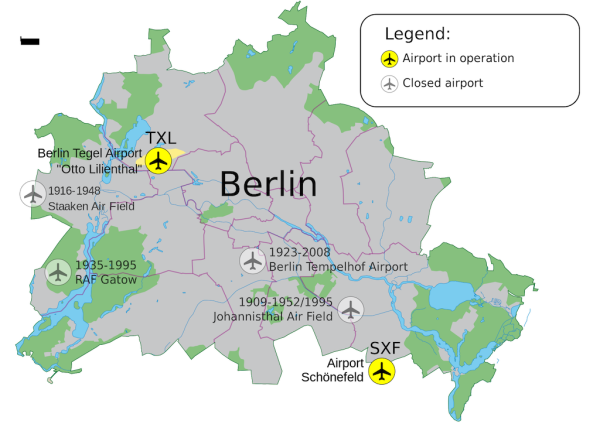 See map of Berlin airports. Before the fall of the Berlin Wall, Schönefeld Airport – SXF (also spelled as 'Schoenefeld') was the only airport of East Berlin. Nowadays, it is known mostly for a wide selection of low-cost flights from carriers as Easyjet, Ryanair and, to a lesser extent, also Wizzair. The airport inaugurated in the 1934 is scheduled to be substituted by the new airport facility in the nearest future. Berlin Brandenburg Airport, designed to take over the traffic of all Berlin airports, was planned to be inaugurated first in 2012, the date which later got postponed to 2016. As of late 2016, Brandenburg Airport has still not operational and the new date of inauguration has not been set. Brandenburg Airport is located right next to Schonefeld Airport and it will incorporate some of Schönefeld’s infrastructures, including its runway. According to the currently existing plans, Schönefeld’s terminals, after a thorough remodelling, will be used by the new Brandenburg Airport to handle low-cost traffic. Schönefeld Airport uses currently four terminals and served, in 2015, 8.5 million passengers, a large majority of them on low-cost routes. The airport is connected to the city centre by railway. The Berlin Schönefeld Flughafen station is located in a walking distance from the terminals and operates Berlin S-Bahn lines S9 and S45, as well as the regional train lines RE Regional Express and RB Regional Bahn. Trains from Schönefeld Airport stop in several convenient locations across Berlin, amongst them Berlin Ostabahnhof, Alexanderplatz, Fridrichstrasse and Central Bahnhof. Bus service from Schonefeld to Berlin is not as convenient and consists mostly of the local BVG bus lines 162 and 171. If you are travelling by car, the A113 motorway, connecting further to A100 is the quickest route. It takes, on average, around 40 minutes to drive from Schoenefeld to Berlin city centre, although, with the heavy Berlin traffic this time may get considerably extended. Berlin Schönefeld Airport is well served of car rental providers and rent-a-car services here are often inexpensive. When booking through online search engines of car hire, such as for example Cartrawler Germany, you will often find the cheapest deals starting from around £ 70-80 for a week. In this price range small city cars (sometimes 3-door only) are the most common, however, with some luck it is also possible to rent an inexpensive economy or even compact car at Schoenefeld Airport. Ford Focus – a compact class car to rent in Berlin SXF, often prices from around £80 per week. Avis, Budget, Enterprise, National , Alamo, Europcar, Hertz, Dollar, Thrifty, Sixt, Interrent, Keddy, Flizzr, Buchbinder and Global Rent A Car are the major car hire providers at Schönefeld Airport. The desks of Berlin Schonefeld rent a car companies can be found in the car rental centre located in front of the Terminal A.
Easyjet is the carrier to offer the widest selection of cheap flights from the UK to Berlin, which are available from Bristol, Edinburgh, Liverpool, London (Gatwick and Luton) and Manchester, amongst others. It is also possible to fly to Schönefeld with Ryanair (East Midlands and Glasgow) and Jet2 (Leeds/Bradford). S Bahn from Schonefeld to Berlin city centre. Rent a car companies SXF. Buchbinder Schonefeld.